Gain Access To Important HIPAA and OSHA Documents, Forms, Policies and More! Find Out If Your Business Is HIPAA Compliant. This Free Trial will give you full access to the HIPAA Complete Compliance Suite for 30 days. We do not collect any credit card or payment information. See what our program is all about. * Must be 8-24 characters, with at least one uppercase, one lowercase and one number. Select Primary State/Territory AL|AlabamaAK|AlaskaAZ|ArizonaAR|ArkansasCA|CaliforniaCO|ColoradoCT|ConnecticutDE|DelawareFL|FloridaGA|GeorgiaHI|HawaiiID|IdahoIL|IllinoisIN|IndianaIA|IowaKS|KansasKY|KentuckyLA|LouisianaME|MaineMD|MarylandMA|MassachusettsMI|MichiganMN|MinnesotaMS|MississippiMO|MissouriMT|MontanaNE|NebraskaNV|NevadaNH|New HampshireNJ|New JerseyNM|New MexicoNY|New YorkNC|North CarolinaND|North DakotaOH|OhioOK|OklahomaOR|OregonPA|PennsylvaniaRI|Rhode IslandSC|South CarolinaSD|South DakotaTN|TennesseeTX|TexasUT|UtahVT|VermontVA|VirginiaWA|WashingtonWV|West VirginiaWI|WisconsinWY|WyomingDC|District of ColumbiaAS|American SamoaGU|GuamMP|Northern Mariana IslandsPR|Puerto RicoUM|United States Minor Outlying IslandsVI|Virgin Islands, U.S.
WE WILL NOT AT ANY TIME COLLECT OR REQUIRE ANY BILLING INFORMATION TO CREATE OR USE A FREE ACCESS ACCOUNT. FOR FREE ACCESS ACCOUNT INFORMATION SEE SECTION 2.1.3. FOR FULL ACCESS ACCOUNT BILLING INFORMATION SEE SECTION 2.5. FOR TERM OF AGREEMENT SEE SECTION 6. TERMS OF SERVICE AND LICENSE AGREEMENT between EPICompliance, LLC, ("we" or "EPICompliance") and the individual or legal entity that orders, uses or pays for EPICompliance.com services ("you" or "Licensee" or "Customer"). THE AGREEMENT. Your use of EPICompliance Services ("Services") is governed by these Terms of Service and License Agreement, the Acceptable Use Policy, and the terms of your Order. Your Order may have additional terms that apply to the particular services in your Order. When we use the term "Agreement" in any of the Order, Terms of Service and License Agreement, or Acceptable Use Policy, we are referring collectively to all of them, including any product specific terms that may apply to the Services. Your use of the Services includes the ability to enter into agreements and make purchases electronically. You acknowledge that your electronic assent constitutes your acceptance to the Agreement for each electronic purchase or transaction you enter. If you enter into this Agreement on behalf of a legal entity as identified in the online registration process, such as the company you work for, the legal entity identified shall be considered the Customer for purposes of this Agreement, and you represent to us that you have the legal authority to bind that entity to this Agreement. 1.1. Compliance Software. 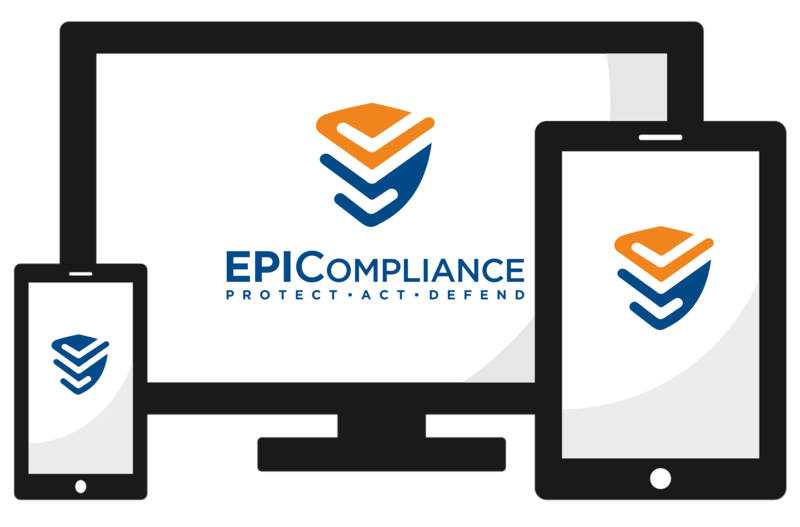 During the term of this Agreement, EPICompliance agrees to provide Licensee and authorized Users with EPICompliance’s electronic compliance software and documentation bundle known as the EPICompliance.com “HIPAA Complete Compliance Suite” ("CCS") for use by license as a resource in their compliance programs. These Services are more fully described at the EPICompliance.com website (Corporation reserves the right to change such documentation as needed). The Services will be provided on a computer server or servers owned, operated or accessible by EPICompliance (the “Server” or "Servers") and will allow Licensee to electronically access templates of policies and forms which Licensee can use as part of their compliance programs. EPICompliance shall maintain and update the templates on an ongoing basis. 1.2. Acceptable Use Policy. All uses of CCS Software must comply with the then-current version of the Acceptable Use Policy (“Use Policy”) available online to Licensee. EPICompliance reserves the right to amend the Use Policy from time-to-time, effective upon posting the revised Use Policy online. Licensee shall comply with the Use Policy, and Licensee shall be responsible for any violation of the Use Policy. EPICompliance reserves the right to suspend the Services or terminate this Agreement effective immediately upon notice to Licensee for any violation of the Use Policy. 1.3. Licensee Representation. Licensee warrants and represents to EPICompliance that: (a) Licensee has the power and authority to enter into and perform Licensee’s obligations under this Agreement; (b) Licensee and Licensee’s authorized Users of the Services shall comply with all provisions of this Agreement, including those contained in Section 1.4 below; (c) Licensee has notified (or will so notify on a timely basis) each authorized User of such User’s duties and obligations under this Agreement with respect to the Services; and (d) Licensee acknowledges and agrees that nothing in this Agreement shall be interpreted as granting Licensee any exclusive rights to Services. 1.4. Prohibited Uses. Licensee and its authorized Users are solely responsible for any and all acts or omissions that occur under any account or password issued to Licensee (and its authorized Users), and Licensee (including for Licensee’s authorized Users) shall not engage in or permit any unacceptable use of the Services or Licensee Services, which include (a) dissemination or transmission (or establishment of links with the Services dashboard, documents or other EPICompliance online presences) of material that, to a reasonable person may be abusive, obscene, pornographic, defamatory, harassing, grossly offensive, vulgar, threatening or malicious; (b) dissemination or transmission of files, graphics, software or other material that actually or potentially infringes the copyright, trademark, patent, trade secret, or other intellectual property right of any person; (c) unauthorized access, interference, disruption or attempt to gain unauthorized access to other EPICompliance or EPICompliance accounts or any other computer network; (d) dissemination or transmission of viruses, Trojan horses or any other malicious code or program; or (e) engaging in any other activity reasonably considered by EPICompliance to conflict with the spirit and intent of this Agreement and the Services. 1.5. Ethical Conduct. In all dealings related to this Agreement, Licensee shall be governed by the highest standards of honesty, integrity, fair dealing and ethical conduct. Conduct amounting to a breach hereof includes, but is not limited to: (i) business practices, publications or postings (online or otherwise), promotions and advertising which may be injurious to the business reputation of EPICompliance, (ii) falsification of any business or personnel records, and (iii) misrepresentations to EPICompliance. 1.6.1. EPICompliance, LLC, Information. Licensee acknowledges and agrees that all EPICompliance property is considered trade secrets of EPICompliance and shall be entitled to all protections given by law to trade secrets. “EPICompliance Information” shall apply to every form in which such information shall exist or is stored, whether written, film, tape, computer disk or other form of media. 1.6.2. Non-Disclosure of EPICompliance Information. Licensee covenants and agrees that, both during the term of this Agreement and at all times thereafter, Licensee shall not use or disclose to any person, firm, corporation or other business enterprise any EPICompliance Information, shall not in any other way publicly or privately disseminate any EPICompliance Information, and shall not help or aid anyone else to do any of these things. Upon termination of this Agreement, all EPICompliance Information (originals and all copies, whether stored electronically, magnetically or in hard copy) in the possession or control of Licensee, its personnel, contractors or any assigns or successor to Licensee, shall be promptly returned to EPICompliance or destroyed. 1.6.3. Non-Disclosure of Other EPICompliance Information. Additionally, Licensee shall keep confidential and not disclose any confidential information or the context of this Agreement to any third-party without prior written consent from EPICompliance (such consent shall be in the absolute discretion of EPICompliance). 1.7. EPICompliance Conduct. EPICompliance will conduct its business related to this Agreement in accordance with the highest standards of honesty, integrity, fair dealing, and ethical conduct. Conduct amounting to a breach hereof includes, but is not limited to: (i) business practices which cause actual injury to the business reputation of Licensee, (ii) falsification of EPICompliance business records related to Licensee and (iii) material misrepresentations to Licensee. 1.8. Licensee’s Personnel and Contractors. Licensee shall be responsible for ensuring full compliance with the terms of this Agreement by its personnel (including any contractors) and shall be fully liable for and enforce any breach of the terms of this Agreement by its personnel and contractors, whether or not such personnel are the currently employed by Licensee. 2.1. License Grant. Subject to the terms and conditions of this Agreement, EPICompliance hereby grants to Licensee, and Licensee hereby accepts, a nontransferable, nonexclusive, revocable license to use Compliance Software and the Services Documentation in conjunction with the Services provided under this Agreement generally made available as the EPICompliance.com HIPAA Complete Compliance Suite. Licensee shall use Compliance Software and the Services Documentation solely for Licensee’s own business operations. Licensee may not sublicense or otherwise transfer (or attempt to do so) use rights to EPICompliance’s software. 2.1.1. Effective Date. The day on which Licensee originally purchased the first License under Licensees payment account on EPICompliance.com is the "Effective Date" of this Agreement and grant of License. 2.1.2. Additional Licenses. Licenses purchased after the Effective Date shall commence on the date of such purchase will not change the Term or Effective Date of this Agreement. Licenses added after the Effective Date will be considered active on the date of purchase. Any Licenses added after the Effective Date shall be subject to this Agreement and any revisions thereto as of the date of purchase of the additional License. 2.1.3. Free Access, Limited Access and Trial Access Licenses and Accounts. We will not collect or require any billing information at any time for any Free Access, Limited Access and Trial Access Licenses and Accounts. Any Free Access, Limited Access and Trial Access Licenses and Accounts granted by EPICompliance shall be subject to this agreement other than notice, breach and termination provisions or other provisions requiring action by EPICompliance. Any Free Access, Limited Access and Trial Access Licenses and Accounts shall be restricted to One (1) User per person or individual or legal entity that would otherwise be required to be an independent full access Licensee. Violation of this restriction shall result in termination of access and account deletion. EPICompliance has sole discretion in these matters and in the level or amount of access to be granted to any Free Access, Limited Access and Trial Access Licenses and Accounts. Notwithstanding any provision of this agreement, EPICompliance may at any time terminate access and delete any Free Access, Limited Access and Trial Access Licenses and Accounts at any time without notice. 2.2. Copies. Any copies of the Software or related information made by Licensee shall remain the property of EPICompliance. 2.3. Reservation of Ownership. EPICompliance transfers no right, title or interest in or to Software except the limited use rights expressly stated in this Agreement. Licensee acknowledges that EPICompliance considers Compliance Software and the Services Documentation to be its exclusive property and that Compliance Software contain unique and valuable proprietary trade secrets and rights of EPICompliance. EPICompliance shall have all rights to any trade Assets, service Assets or other intellectual property rights related to Compliance Software and the Services Documentation. Licensee is granted only the specific use rights expressly set forth in this Agreement and no others. 2.4. Modifications. Neither Licensee nor any User shall alter, modify, translate, reverse engineer, decompile, disassemble or adapt, in whole or in part, Compliance Software or the Services Documentation. 2.5. Licensee Services Responsibilities. Except as expressly set forth in this Agreement, Licensee shall be solely responsible for: (a) the conversion of all documents to electronic form that are to be stored in connection with the Services; (b) providing, maintaining and ensuring compatibility with EPICompliance and the Services of all hardware, software, electrical and other physical requirements, including, without limitation, telecommunications and digital transmission connections and links, routers, local area network servers, virus software, firewalls, Server and Internet connectivity and Internet browser (the “Services Browser”) and any other equipment and services required to access Compliance Software and use the Services, except as may be provided by EPICompliance; and (c) any security measures which are Licensee’s obligation under this Agreement. 2.5.1. Fees and Expenses. For the Services, Licensee shall pay the fees, expenses and charges (“Fees”) indicated in this Agreement. Unless additional Licenses or Users are added by Licensee, the monthly Fees shall be the amount that was charged on the Effective Date. For limited access or trial access Licenses there will be no Fees charged unless converted to a full access License which will be charged as of the date of conversion at the then current Fees. Limited access or trial access accounts will not be charged for any prior use. 2.5.2. Invoicing and Automatic Monthly Payments. EPICompliance, LLC, shall furnish via email Licensee a monthly invoice, stating the amounts due to EPICompliance. Fees are prepaid for the next billing period and are not refundable once paid. Payment of each invoice shall be due as of the date stated on each invoice. Initial payment by Licensee may be made by Credit Card, Debit Card or eCheck/ACH. Monthly License payments will be generated monthly on the nearest business day on or after the Effective Date. 2.5.3. Additional Licenses Payment and pro-rata payment. Fees for Licenses or products added after the Effective Date will be the then-current Fees for Services. These Fees will be charged either on the next monthly payment or immediately at purchase and will include any pro-rata payment for that additional License or product for the remainder of that month in which the License or product was added. 2.5.4. Term of Monthly Payments. Per Section 6, below, Licensee agrees to pay Monthly Payments. Monthly Payments are to be made on a month-to-month basis. 2.5.5. Missed or Failed Monthly Payments. Should there be insufficient funds or payment failure for any reason EPICompliance will make at least one (1) additional attempt at payment within seven (7) business days of the original payment failure. If payment failure continues, at no less than thirty (30) days after initial payment failure EPICompliance may cancel Licensee's access to Services and Terminate this Agreement. At EPICompliance's sole discretion, if two (2) or more separate monthly automatic payment failures occur, EPICompliance may charge Licensee the then-current Fee for Licensee's Services or terminate this Agreement. 2.5.6. No change in Fees for Accounts that remain current. EPICompliance will not raise original Fees charged to Licensee as long as Licensee's Monthly Payments remain current. Additional Services or products Fees will be charged at the rate on the date of purchase. Per Section 2.5.5 EPICompliance reserves the right to raise Fees in the event of two (2) or more missed Monthly Payments. 2.6. Access. EPICompliance shall use commercially reasonable efforts to make the Services available for use 24 hours a day, seven days per week (with the exception for scheduled maintenance downtime). The foregoing times of operation may be modified to provide for (a) regularly scheduled maintenance, (b) maintenance required as a result of matters beyond EPICompliance’s reasonable control or (c) events beyond EPICompliance’s control. Additionally, EPICompliance shall not be responsible for any unavailability of the Services resulting from (i) any Licensee-ordered telephone circuits; (ii) Licensee’s applications, equipment or facilities or (iii) acts or omissions of Licensee. EPICompliance will perform maintenance services as it determines reasonably necessary to maintain the continuous operation of the Services. Notice of scheduled maintenance will be provided by e-mail to Licensee’s designated point of contact at least 48 hours prior to such maintenance being performed. EPICompliance will use reasonable efforts to conduct routine scheduled maintenance during off-peak or low traffic periods. 3. Service Level Guarantee, Remedy and Limitation of Damages. 3.1. Service Level. Subject in all cases to the provisions of this Agreement, EPICompliance guarantees and represents to Licensee that the System will be available at least 99.9% of the time during each discrete 24-hour consecutive period while this Agreement remains in effect. EPICompliance may supplement its service level agreement from time-to-time as posted online on EPICompliance.com; provided that, no supplement shall be considered to reduce the obligations of EPICompliance under this Agreement to such effect shall have been mutually agreed by the parties. 3.2. Remedy. The sole and exclusive remedy of Licensee for a breach of EPICompliance's obligations shall be limited to a rebate credit to Licensee’s account with EPICompliance for a prorata share (as determined below) of the Fees paid by Licensee for the calendar month in which such breach(es) shall have occurred (such charges collectively herein the “Licensee Charges”). For each cumulative hour or fraction thereof within each discrete 24-hour consecutive period within such calendar month the System shall not be available as required above (“System Unavailability Period”), Licensee’s account, upon request by Licensee, shall be credited with an amount equal to a daily prorated share of the Licensee Charges for such month; provided that, in no case shall such credit exceed a maximum credit equal to (i) such prorated Licensee Charges for any such 24-hour period, or (ii) for any month, the Licensee Fees for such month. Upon the request of Licensee, EPICompliance will calculate the System Unavailability Period for any calendar month during the term of this Agreement and process Licensee’s claim for the rebate credit related thereto as provided pursuant to the claims procedure set forth on the compliance Software website; provided that, (a) Licensee shall have opened a trouble ticket with EPICompliance's Licensee support department within five days following the date each such System Unavailability Period is asserted by Licensee to have occurred and (b) such request is made to EPICompliance within 45 days following the calendar month to which such System Availability Period claim relates. 3.3. Disclaimer. EPICOMPLIANCE, LLC, DOES NOT WARRANT THAT THE FUNCTIONS CONTAINED IN COMPLIANCE SOFTWARE OR THAT ACCESS TO THE SERVICES WILL BE UNINTERRUPTED AT ALL TIMES OR ERROR FREE, THAT ALL DEFICIENCIES, ERRORS, DEFECTS OR NONCONFORMITIES WILL BE CORRECTED OR THAT COMPLIANCE SOFTWARE OR THE SERVICES WILL MEET ANY SPECIFIC REQUIREMENTS. EPICOMPLIANCE MAKES NO REPRESENTATIONS OR WARRANTIES ABOUT THE SUITABILITY OF THE SERVICES FOR ANY PURPOSE, EXCEPT AS EXPRESSLY PROVIDED OTHERWISE IN THIS SECTION. THE SERVICES ARE PROVIDED “AS IS” AND EPICOMPLIANCE MAKES NO WARRANTIES OF ANY KIND, EXPRESS OR IMPLIED, INCLUDING, BUT NOT LIMITED TO, ANY IMPLIED WARRANTIES OF MERCHANTABILITY OR FITNESS FOR A PARTICULAR PURPOSE WITH RESPECT TO THE SERVICES FURNISHED TO LICENSEE OR OTHER TRANSACTIONS CONTEMPLATED BY THIS AGREEMENT. 3.4. Consequential Damages. EPICOMPLIANCE SHALL NOT BE LIABLE TO LICENSEE FOR ANY SPECIAL, INDIRECT, INCIDENTAL, CONSEQUENTIAL, EXEMPLARY, PUNITIVE OR COVER DAMAGES (EVEN IF EPICOMPLIANCE HAS BEEN ADVISED OF THE POSSIBILITY OF SUCH DAMAGES) ARISING FROM THE PERFORMANCE, ATTEMPTED PERFORMANCE OR NONPERFORMANCE OF COMPLIANCE SOFTWARE OR THE SERVICES FURNISHED HEREUNDER, INCLUDING, BUT NOT LIMITED TO, DAMAGES RESULTING FROM THE USE OF, OR INABILITY TO USE, COMPLIANCE SOFTWARE, DELAY OF DELIVERY OR COMPLETION OF SERVICES, INACCURACY OR MISREPRESENTATION OF DATA, OR LOSS OF PROFITS, DATA, BUSINESS OR GOODWILL. 3.5. Limitation of Liability. EPICOMPLIANCE’S TOTAL LIABILITY FOR ANY AND ALL CLAIMS, WHETHER IN AN ACTION IN CONTRACT OR IN TORT, INCLUDING, BUT NOT LIMITED TO, NEGLIGENCE OR STRICT LIABILITY, FOR ANY LOSS OR INJURY ARISING OUT OF, CONNECTED WITH OR RESULTING FROM EPICOMPLIANCE’S PERFORMANCE OR BREACH OF THIS AGREEMENT OR THE USE, PERFORMANCE OR NONPERFORMANCE OF EPICOMPLIANCE’S SOFTWARE OR THE SERVICES PROVIDED HEREUNDER, OR ANY PART THEREOF, SHALL NOT EXCEED THE TOTAL AMOUNT OF THE FEES PAID BY LICENSEE TO EPICOMPLIANCE DURING THE PRIOR 3 MONTH PERIOD (OR PORTION THEREOF, IF THIS AGREEMENT HAS BEEN IN EFFECT LESS THAN 3 MONTHS) FOR THE SERVICES THAT CAUSE THE LOSS OR INJURY OR ARE THE SUBJECT MATTER OF THE CLAIM OR CAUSE OF ACTION. 3.6. Allocation of Risk. Licensee and EPICompliance expressly acknowledge and agree that the limitations and exclusions contained in this Section have been the subject of active and complete negotiation between the parties and represent the parties’ agreement as to the allocation of risk between the parties based upon the level of risk to EPICompliance and Licensee with their respective obligations under this Agreement. The payments payable to EPICompliance in connection herewith reflect this allocation of risk and the exclusion of Consequential damages in this Agreement. The parties acknowledge that, but for the limitations in this Section, the parties would not have entered into this Agreement. 3.7. Indemnification. Licensee shall defend, indemnify, protect and hold EPICompliance and its affiliates, shareholders, directors, officers, employees and agents, harmless from and against any liabilities, actions, losses, costs, expenses (including attorneys’ fees and costs) or claims incurred by any of them as a result of (a) any use or misuse of Assets or the Services provided to Licensee hereunder (whether by Licensee or any other person, including any Licensee’s Customer), including any resulting from any third-party claim or allegation arising out of or relating the Licensee’s or others’ use or provision of the Services (including any actual or alleged violation of the Use Policy), (b) any claims arising out of Licensee’s or others’ use of any third-party’s equipment or software with Assets or the Services based on the alleged infringement or misappropriation of any intellectual or other property fights of any such third party, or (c) Licensee’s conduct of its business and operations, including use of the Services by Licensee, except in the case solely due to the gross negligence or willful misconduct of EPICompliance. 3.8. Security Measures. EPICompliance and Licensee shall implement and maintain reasonable security procedures relating to Licensee’s access to EPICompliance’s Software. Licensee shall be responsible for administering the procedures relating to the assignment and administration of all identification codes and passwords authorizing access to Assets on behalf of or for the benefit of Licensee and its authorized Users, and Licensee shall be responsible for taking appropriate security measures relating to such identification codes and passwords. 3.9. Disaster Recovery. Subject to the provisions on this Agreement, EPICompliance agrees to maintain, and will continue to maintain throughout the effective term of this Agreement, disaster recovery capabilities that permit EPICompliance to recover from a disaster and continue providing Services to its subscribers within a commercially reasonable period. Licensee acknowledges that EPICompliance has recommended to Licensee that Licensee maintain backups, in accordance with industry standards, for any data, information and documents Stored by or through Licensee on its server. EPICompliance shall have no responsibility for Licensee’s offsite backup for such data, information and documents. Both Parties are committed to complying with the Standards for Privacy of Individually Identifiable Health Information (the “Privacy Regulation”) under the Health Insurance Portability and accountability Act of 1996 (“HIPAA”). If Licensee opts to upload any Personal Health Information then it is understood that both Licensee and EPICompliance shall complete a Business Associate Agreement. 5.1. Confidential Information. During the term of this Agreement, a party may provide the other party with certain confidential and proprietary information (“Confidential Information”). Confidential Information may include a party’s trade secrets, information relating to a party’s business operations, services, products, research, development, Licensees, finances, marketing plans and strategies, pricing strategies and shall include any source code, design specifications, drawings and data flow analyses. Notwithstanding the foregoing, the term “Confidential Information” shall not include information that (a) is publicly know at the time of its disclosure, (b) is lawfully received by the receiving party from a third-party not under an obligation of confidentiality to the disclosing party, (c) is published or otherwise make known to the public by the disclosing party, or (d) was generated independently by the receiving party before disclosure by the disclosing party. Each party shall exercise at least the same degree of care to protect the confidentiality of the other party’s Confidential Information which such party exercises to protect the confidentiality of such party’s own similar Confidential Information, which shall not be less that the industry standard. As long as a party meets this standard of care, such party shall have no additional obligations or liability regarding confidentiality, except for Licensee’s obligations under the previous section. 5.2. Confidentiality Obligations. In the course of performing under this Agreement, each Party may receive, be exposed to or acquire the confidential information including but not limited to, all information, data, reports, records, summaries, tables and studies, whether written or oral, fixed in hard copy or contained in any computer data base or computer readable form, as well as any information identified as Confidential Information of the other Party. For purposes of this Agreement, Confidential Information shall not include Protected Health Information, the security of which is not the subject of this Agreement and is provided for elsewhere. The Parties including their employees, agents or representatives (i) shall not disclose to any third party the Confidential Information of the other Party except as otherwise permitted by this Agreement, (ii) only permit use of such Confidential Information by employees, agents and representatives having a need to know in connection with performance under this Agreement, and (iii) advise each of their employees, agents, and representatives of their obligations to keep such Confidential Information confidential. This provision shall not apply to confidential Information: (a) after it becomes publicly available through no fault of either Party; (b) which is later publicly released by either Party in writing; (c) which is lawfully obtained from third parties without restriction; or (d) which can be shown to be previously know or developed by either Party independently of the other Party. 5.3. Licensee’s Personnel and Contractors. Licensee shall be responsible for ensuring full compliance with the terms of this Agreement by its personnel and contractors and shall be fully liable for and enforce any breach of the terms of this agreement by its personnel and contractors, whether or not such personnel or contractors are then currently employed by or working for Licensee. 5.4. Non-Disclosure. No party, unless required by law or judicial process, shall disclose any of the other party’s Confidential Information to any person, or permit any person to use, examine or reproduce such Confidential Information, unless such Confidential Information has become public knowledge through means other than breach of this Agreement. If Licensee does not maintain the confidentiality of EPICompliance’s Confidential Information, EPICompliance may suspend or terminate the Services. A party shall be entitled to obtain injunctive relief for any continuing violation of this Section in addition to any other remedy or relief to which such party may be entitled. This Agreement shall commence as of the Effective Date and shall continue on a prepaid Month to Month basis, subject to either party’s ability to terminate this Agreement as provided in this Agreement. This Agreement shall automatically renew for successive one (1) month terms (each a “Renewal Term”). 7.1. General and During Term. Notwithstanding other sections of this Agreement, either party may terminate this Agreement upon the occurrence of a material breach by the other party if the breach has not been cured within thirty (30) days following receipt of written notice thereof. EPICompliance shall have the right to suspend or terminate the Services if any amount due EPICompliance from Licensee remains unpaid more than thirty (30) days after its due date. Licensee may terminate this Agreement upon at least 30 days’ written notice to EPICompliance. 7.1.1. Frustration of Purpose. If during the Term of this Agreement a License becomes no longer necessary due to closure of business, retirement of principal business owner; death or disability of principal business owner, or other similar circumstance then such License may be Terminated upon thirty 30 days' written notice to EPICompliance or at the sole discretion of EPICompliance. 7.2. During Renewal Terms. Notwithstanding other sections of this Agreement, during any Renewal Term Licensee may terminate this Agreement at any time by furnishing at least 30 days' written notice to EPICompliance. 7.3. Archive License data after Termination. In the event of a post-Termination government audit or similar event, Licensee may be given access to the data and/or compliance services License as available at that time. Duration and other scope of access shall be at the sole discretion of EPICompliance. In this event Licensee agrees to pay reasonable expenses, for such post-Termination access and the greater of $500 or two-hundred percent (200%) of the total License Fees that would have been charged from the date of Termination to the date post-Termination access requested. Notwithstanding this, EPICompliance provides no warrantee of any kind and is under no obligation to archive or make available any data or License function after Licensee Termination other than by terms stated herein. 8.1. Data. Licensee shall notify EPICompliance in writing for any request to remove or deactivate all data stored for purposes of the compliance Software as provided in this Agreement. 8.2. Unpaid Amounts. Licensee shall pay EPICompliance unpaid Fees (including pro rata charges for any Termination for any Termination not occurring on a payment day) up to and including the date of Termination. EPICompliance is under no obligation to refund any payments (pro rata or otherwise) for mid-month Termination. 8.3. Access. Access, other than in order to comply with the provisions of this Agreement, Access granted pursuant to this Agreement shall terminate automatically, and Licensee shall immediately cease accessing or attempting to access Software and EPICompliance will deactivate access. 8.4. Survival. A party’s obligations under this Agreement shall cease except for those remaining or required to be performed following such Termination. 9.1. General. Other than as part of an online process established by EPICompliance, all notices to be sent by Licensee regarding the terms of this Agreement or relating to disputes, non-renewal or termination shall be in writing and sent either by registered or certified mail, return receipt requested, or delivered personally, as applicable, to the attention of the Contract Administrator of EPICompliance. Such notices may be sent by EPICompliance to the President or appointed representative of Licensee at the respective address or email address as listed on the Account associated with License(s) subject to notice. 9.2. Operational Notices. Notwithstanding any other section of this Agreement, any notices from EPICompliance with regard to operational matters concerning Software or the Services provided pursuant to this Agreement (such as notices regarding maintenance downtime) may be sent by e-mail. Such notices shall be deemed effective at the time that they are sent: however, due to the nature of e-mail, EPICompliance cannot assure the timely delivery of such notices. Licensee shall be responsible for keeping EPICompliance informed on any change in Licensee’s email address to which notices may be sent by email as permitted by this Agreement, and notice sent to the Licensee’s last-known email address contained in EPICompliance's records shall be considered to comply with the requirements of any email notice provision contained in this Agreement. 10. Force Majeure. In no event shall EPICompliance be liable for delaying the performance of the Services or for any damages suffered by Licensee when such delay or nonperformance is due to causes beyond EPICompliance’s reasonable control, including, but not limited to, Acts of God, fire, strikes, floods, power outages, communication failures, epidemics, quarantine restrictions, terrorism, war, insurrection or riot, civil or military authority, compliance with priority order or preference rating issued by any federal, state or other governmental authority, freight embargoes, car shortages, wrecks, delays in transportation, unusually severe weather (including lightning strikes), interruptions in service or inability to obtain necessary labor or materials. 11. Attorneys’ Fees. In the event that an action is brought by a party to enforce any provision of this Agreement, the prevailing party shall be entitled to reimbursement of such party’s reasonable attorneys’ fees and expenses of any kind or nature incurred in connection with such action in addition to any other remedy or relief to which such party may be entitled. 12. Governing Law and Limitations. This Agreement and performance hereunder shall be governed by and construed in accordance with the laws of Florida without reference to its conflict to laws rules. In the event Licensee initiates action, Licensee consents to jurisdiction and venue in a court of competent jurisdiction in Duval County, Florida, and waives all objections thereto. Licensee agrees that any claim against EPICompliance must be filed within one (1) year of its accrual or such claim shall be considered forever waived. 13. Severability and Interpretation. If any provision in whole or in part, of this Agreement or the Use Policy is held invalid or unenforceable for any reason, such determination shall not affect the validity of the remaining provisions of this Agreement or the Use Policy, and the parties shall substitute for the invalid or unenforceable provision a valid and enforceable provision which closely approximates the intent and economic effect of such invalid or unenforceable provision. Neither this Agreement nor any schedule, addendum, exhibit or the Use Policy shall be interpreted in favor of or against a party, because such party or its counsel drafted this Agreement or such schedule, addendum, exhibit or Use Policy. No course of dealing, usage, custom of trade or communication between the parties shall modify or alter any of the rights, responsibilities or obligations of the parties under this Agreement unless reduced to writing. The headings and captions in this Agreement are included for convenience and ease of reference only and shall be disregarded in interpreting or construing any provision of this Agreement. The use of any gender shall include any gender and the use of the singular form shall include the plural form and vice-versa. 14. Independent Contractors. The parties, and their respective personnel, are and shall be independent contractors, and no party by virtue of this Agreement shall have any right, power or authority to act or create any obligation, express or implied, on behalf of the other party. 15. Assignment. Neither party may assign its rights or delegate its obligations under this Agreement without the other party’s prior written consent (which consent shall not be withheld unreasonably or unduly delayed). 16. Waiver. No waiver or modification of any right, term condition or obligation under this Agreement or the Use Policy or any breach thereof, shall be effective unless granted in writing by the waiving party. No failure to exercise or delay in exercising any right under this Agreement by a party shall operate as a waiver of such right, except as expressly provided in this Agreement. 17. Complete and Entire Agreement. This Agreement, including any schedules, exhibits, applicable Guide and the Use Policy, constitutes the entire agreement between the parties and supersedes any prior agreement or understanding. Except as expressly provided in this Agreement, this Agreement shall not be modified or amended unless in writing and signed by each party, and no course of dealing, custom of trade or oral statement(s) shall be considered to amend or modify this Agreement until set forth in such a writing. 18. Independent Investigation. LICENSEE ACKNOWLEDGES THAT LICENSEE HAS READ THIS AGREEMENT AND UNDERSTANDS AND ACCEPTS THE TERMS, CONDITIONS AND COVENANTS CONTAINED HEREIN AS BEING REASONABLY NECESSARY TO MAINTAIN EPICOMPLIANCE’S HIGH STANDARDS FOR SERVICES AND THE REPUTATION OF SOFTWARE AND SERVICES. LICENSEE HAS INDEPENDENTLY INVESTIGATED EPICOMPLIANCE’S SOFTWARE AND SERVICES AND RISKS THEREOF AS TO LICENSEE AND IS NOT RELYING ON ANY REPRESENTATION, WARRANTY, GUARANTY OR STATEMENT OF EPICOMPLIANCE OTHER THAN AS EXPRESSLY SET FORTH IN THIS AGREEMENT. © Copyright EPICompliance, LLC, — Revised January 22, 2018. Comply with the intricate privacy rules and regulations of the Health Insurance Portability and Accountability Act (HIPAA). Simple waivers are not enough for compliance. Fines are up to $50,000 per incident. Enough said. Policies: Continuously updated library of HIPAA policies in order to meet the ongoing requirements and evolution of the regulatory environment. Forms: Standardized forms for implementation of policies and most-importantly: HIPAA training and recognition of policy awareness. It is not enough to have policies available – personnel must be educated and tested and these policies must be used – you must be able to prove the policies are followed. HIPAA Documents A cloud-based document management repository provides secure storage and access for HIPAA Policies, Forms and uploaded related/supporting documents. Training: HIPAA and compliance officer certification through our education system – convenient online training courses with verifiable testing and completion certificates. It is not enough simply to know and follow the security rules and regulations of the Health Insurance Portability and Accountability Act (HIPAA). A simple text message about a patient or someone with protected information can be a severe violation. HIPAA Security compliance is mandated separately from privacy. Not only must information be kept private, it must be kept securely and protected from breach. The HIPAA Security Mandates cannot be waived. And you must prove compliance to auditors. Note that healthcare professionals are no longer alone here: Business Associates not accustomed to these heightened security requirements are at high risk here. Any Business Associate or vendor that you hire, such as IT companies etc. Also are required to be HIPAA Compliant. Forms: Standardized forms for implementation of policies and most-importantly: training and recognition of policy awareness. It is not enough to have policies available – personnel must be educated and tested and these policies must be used – you must be able to prove that all HIPAA policies are followed. Documents A cloud-based document management repository provides secure storage and access for HIPAA Policies, Forms and uploaded related/supporting documents. Training: HIPAA and compliance officer certification through our training system – convenient online courses with verifiable testing and completion certificates.